All this week we're getting excited for Live 9's imminent release by delving into the DAW's new features. Yesterday, in part one, we took a look at the revamped EQ Eight plugin and the brand new Glue Compressor. Now we turn to the rest of the dynamics processors and play with the new device browser. It's not all about EQ Eight in the new look Live - the dynamics processors have seen similar functional and graphical improvements. First off, reduction displays and threshold indicators have been added to the Compressor and Gate. It's hard to overstate the benefit this offers, and it brings the plugins into line with such commercial third-party gems as DMG Audio's Compassion and Fabfilter's Pro range. The Gate also features a new gain reduction meter and a Return parameter (effectively a hysteresis control) to reduce the gate 'chatter' you get when the signal level finds itself hovering around the threshold. The Compressor has had even more added than the Gate. In addition to the new display mode, you still have the option of keeping the traditional curve reduction view, and a new compact display mode has also been added, showing just the input, output and gain reduction meters. It is easy when tweaking dials on a 'traditional' front panel to forget (or simply not know) exactly what's happening to the signal, but being able to visualise what you're hearing gives a much clearer understanding of the process. We find it also discourages over-processing a lot of the time - it can be quite shocking to see your exciting dynamic spikes being turned into so much flatlined sonic mush! If even these new-fangled features can't help you to decide on useful parameter settings, there's now an Auto release control and a new logarithmic reduction curve option to help smooth things over. At the other end of the functional spectrum, should you ever find yourself dealing with an over-compressed signal, the new Expand mode lets you restore those peaks. Finally, there's now a Dry/Wet control for some trendy parallel compression. Clearly, then, there's plenty to be excited about in the Device Rack. But there's much more to Live 9 than just snazzed-up effects. Even diehard fans have to admit that Live's Browser has never been the friendliest to navigate or use. It worked, but it wasn't easy on either the eye or the brain. Live 9's new Browser aims to address this long-standing problem. 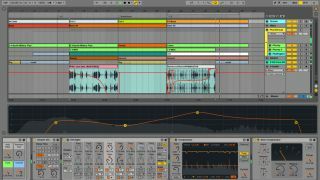 The whole Browser window has been redesigned, with much more clearly defined menu tags enabling you to search for presets, drums, audio effects, instruments, plugins, samples and your various add-on libraries with greater ease. The latter are housed under the Places tag and include Live packs, your local drives and any other folders your care to create (by simply dragging them into the window). Significantly, these Places, Packs and libraries can be housed on any drive you wish. Locating packs in the library is now a much more straightforward affair. The search function has seen perhaps the most dramatic update, though. You can now simply type in a search term such as 'Lead', and Live will offer you everything with the word 'Lead' in the name, including loops, synth presets and clips. All of these can now be instantly auditioned, which is something you could previously only do with audio clips. You can narrow your search by type, too, if you like, and if you've used a search result previously, Live will give weight to it in the results using a behind-the-scenes ranking system.